My post for today is for the Jazzy Inspirations Challenge. It's a day early so please check Tenia's blog tomorrow for the official challenge posting & to see the rest of the Design Team's creations. This week we had the opportunity to paruse the Jazz Art Rotterdam site and choose what we wanted for inspiration. I looked through the art section and found this painting.....the colors on that beauty just screamed bees to me so I had to use them. I also used the Twisted Thursday sketch & the twist this week was to use embossing......easy peasy!!! We'd love for you to play along with us for the opportunity to be the Jazz Cat of the Week! Just go to the above site and choose your inspiration. Make your creation and link it to Tenia's blog. Have fun creating and good luck!!! I'll be hitting the highway in a bit. I wanted to let you know that comment moderation is on so if you don't see your post; don't fret. They'll be posted when I return on Sunday. I'm looking forward to having a great time in MN and having swaps to share with you when I get home!! Thanks so much for stopping by and have a great rest of the day!!! Have a safe & fun trip! Yeah, Jackie! This is adorable. Thanks for playing the Twisted Thursday sketch challenge. Jackie this card is absolutely adorable!! :) I love the yellow on the embossed piece. It all fits together perfectly! Jackie, your card is so cute and bright! Those bees just make me smile! Thanks so much for playing along with our challenge this week! Looking forward to more fabulous creations from you in the future! Hugs! Have fun and come back with some great swap for us to peak at on the 25th. This is so sweet Jackie!! What darling little bees!! :) TFS! This turned out super cute I love those bees do not have them yet, but I do love them!! I love the oragne circle too!!! Love the cute cute bee's! have a great trip!! Its a honey of a card (couldn't help myself!) sounds like you have been busy! Love your blog! Jackie so glad you could play along this week. What an adorable card. Good Luck! Holy cow that is awesome! Makes me want to buy that stamp set! Thank for sharing! I absolutely love your card. 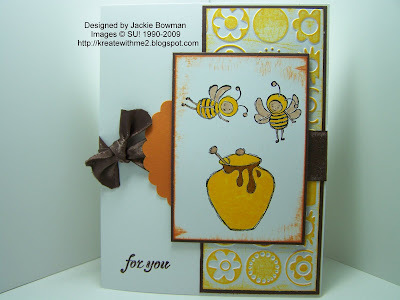 Love the colors and what you did with the cuttlebug embossing folder! Thanks for playing along! You used the new bees set, how cute! Nice, happy colors too. The bloom dots folder looks terrific with this Just Buzzin By images. Have lots of fun on your trip! I wish you a safe trip. I love these cute cute cute bees!! Great blog! This is gorgeous Jackie, love the embossing. This is fabulouse, Jackie! I love the embossed paper and how you inked it up! Beautiful spring card! Very cute! Love those little bees! Fabulous!! Love the bees, the sketch and the jazz challenge. This card is sweet as honey!! Oh, I love the stamps you have used ... too cute! jackie, this is toooo cute!!!! !